"When you're going up, you breathe in, and when you're going down, you exhale,” explained 8-year-old Dhruv Rathod as he outlined his outstretched left hand with his right-hand index finger. The third-grader starts slowly breathing in through his nose as he traces up one side of his thumb….and then slowly breathes out of his mouth as he traces the other side of his thumb before moving on to the next finger, and so on. "Like that,” he said proudly when he was done with his breathing exercises. He learned mindfulness training last year as a second grader at Deerfield Elementary School in Novi. His teacher at the time was Sherry Griesinger. It was her idea to try a new approach to helping her kids settle into learning. "They would come out of the lunchroom, and things would be crazy! So that was really my focus is after lunch. [I thought] what could we do after lunch to get them calmed down from recess and ready for learning in the afternoon,” recalled Ms. Griesinger. She knew retired teacher Carol Lafferty had become a certified mindfulness instructor through Mindful Opportunities -- a mindfulness-based stress management and cognitive training for children and adults. So, Griesinger invited "Ms. Carol" to give her second graders some lessons. "Mindfulness is all about paying attention to what is happening in the present moment right now,” explained Lafferty. "To [help kids] stop first, take a couple of breaths, give themselves the space. It only takes a few seconds before they can start thinking, 'Oh, I have choices.'" Retiring from teaching to take the mindfulness certification classes was something she contemplated for a long time. "It was a big decision for me to leave the classroom, and this is the payoff,” she explained. “Because [mindfulness] is not something that's just getting them through school; it's getting them through life." It's a powerful statement, but it's one that has teeth. Two years after she introduced the technique to Ms. Griesinger’s class, those kids are still using what they learned! Her classmate Avery Dorogi agreed and said you can practice mindfulness anywhere. "If you're in a rush, you can calm down and do it while you're walking there. Or if you're just standing and sitting, you can breathe for a bit and then go play or whatever,” explained Avery Dorogi. The introduction of mindfulness training in the classroom has gone so well; the Novi Educational Foundation approved Ms. Griesenger’s grant to teach all of Deerfield Elementary’s second-graders mindfulness last year. Assistant Superintendent of Academics at Novi Community School District -- Dr. R. J. Webber -- even noticed a difference with his child Ian. "One night I came home from school, and I said, 'Hey, what would you like to do?' And he's like, 'I'd like to practice mindful breathing.' And my head kind of snapped, and I was like, 'What are you talking about?' Next thing I know he's popped up into full Lotus on the couch and is engaging in what he learned from Ms. Carol,” recalled Dr. Webber with a smile. And remember Dhruv? He said this tool has even helped him deal with bullies. “I would step aside and use mindfulness to kind of calm down and then act." He said the bullies noticed, and the bullying stopped. 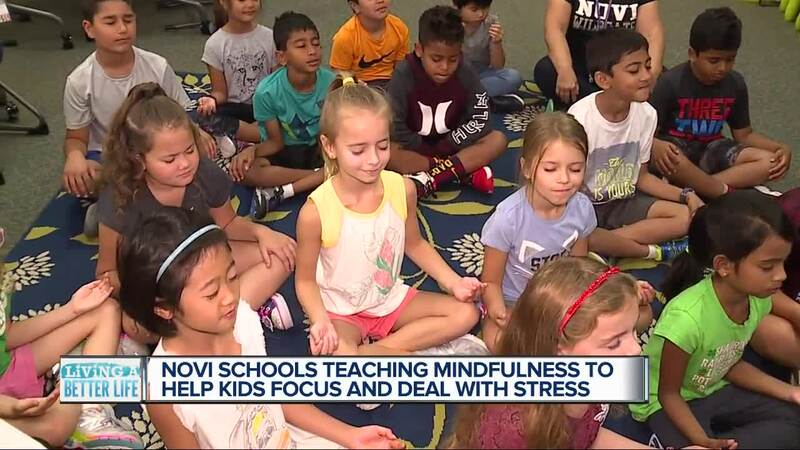 The Novi Community School District is rolling out mindfulness training to all second graders district-wide this fall. “How many of you do mindfulness?” I asked a group of kids in the media room of Deerfield Elementary. All of the kids raised their hands. I followed with this question: “How many of you think your parents should learn mindfulness?” It was unanimous as well. Yes, even adults can practice mindfulness. Carol Lafferty’s advice to adults who want to be mindful? First of all, disconnect from electronic devices for a set time each day. Then close your eyes and take some deep breaths. She said there's one technique called 7-11 -- where you breathe in through the nose for a count of 7, and then exhale for 11 counts. It’s an easy way to start a practice that could lead to a calmer, more focused life. If you have a story idea for Alicia Smith’s Living A Better Life series, please email her at Alicia.Smith@wxyz.com with “Living a Better Life” in the subject line.